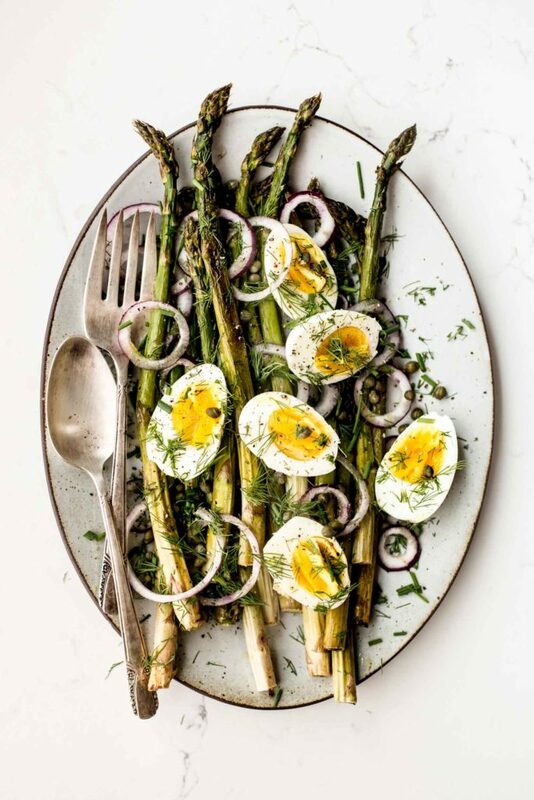 This simple roasted asparagus salad with hard boiled eggs, fried capers, herbs and plenty of olive oil is the perfect way to celebrate the early spring. I love a good hearty salad that’s light and refreshing while still filling me up. This not only tastes great with a side of grilled salmon or chicken, but could easily be turned into a veggie bowl with some cooked green lentils and a little feta cheese crumbled on top–which is how I plan on eating this next time! Anyhow, this is my last post for a couple of days because Taylor and I are jetting off to NYC on a red-eye flight tonight. My father-in-law is in town holding down the farm for us so we can enjoy what is sure to be a whirlwind of a trip. We’ve scrubbed the dirt from underneath our finger nails, packed our nicest clothes (aka our non farming attire) and are pretty much ready to rock! It’s hard to leave the farm behind but we are really looking forward to experiencing the city, meeting my whole book team (big shout out to HarperCollins!) and some good eats along the way. I’ll be doing two book signings and I cannot wait to shake hands with folks who are dishing it up in the Big Apple. Watch out folks, Tumbleweed Farm is coming in hot! Preheat the oven to 425F. Place the asparagus on a rimmed baking sheet and set aside. Whisk together the olive oil, lemon juice, lemon zest, honey, salt and pepper. Drizzle over the asparagus and toss until evenly coated. Bake in the oven until the asparagus is crisp tender and lightly charred in places. About 15-20 minutes. Toss halfway through cooking. Meanwhile heat 1 tablespoon of olive oil in a small skillet over medium-high heat. When the oil is hot carefully add the capers (be careful as the oil can splatter a bit.) Fry until the capers or golden and lightly crisp, shaking the pan a few times. About 3 minutes. Set aside on a paper towel lined plate to cool. Heat a large pot of water and bring to a boil. Add your eggs and cook for 8 minutes. Remove from the heat and run the eggs under cold water. When cool enough to handle peel the eggs and slice them in half. Place the cooked asparagus on a large platter. Sprinkle with the red onion, eggs, herbs and fried capers. Season to taste with salt and pepper and drizzle a little extra virgin olive oil over everything before serving. This is just such a stunning and colorful dish. Gosh, you can make any food look like artwork, girl! Okay… this is what I’m gonna make for lunch today. I can’t wait. I LOVE asparagus season. OMG…can’t wait to try this! I love asparagus..thanks for sharing. Made this last night and although I overcooked the asparagus a bit, it was still absolutely delicious!!! So glad you still enjoyed it!